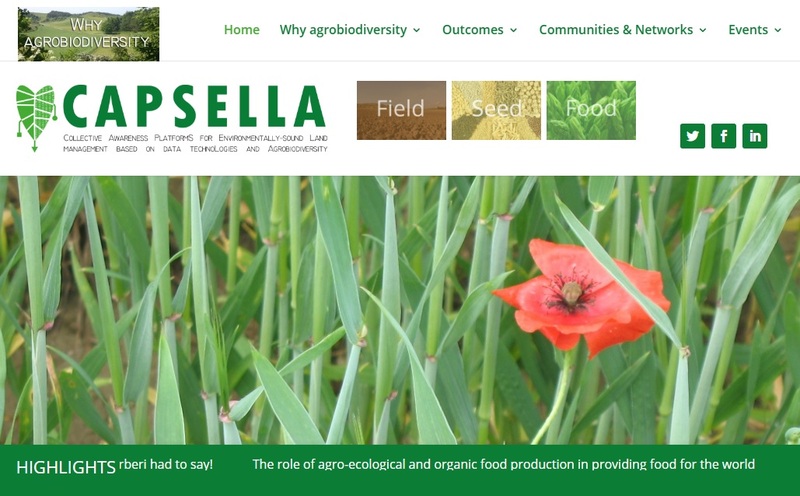 A Horizon 2020 EU-funded CAPSELLA project aims at developing novel ICT solutions tailored to the needs and requirements of farmers’ local communities and networks and other actors engaged in agrobiodiversity. “The objective of the research in this field is to harness the collaborative power of ICT networks to create collective awareness of sustainability threats and enable collective solutions” (HORIZON 2020). to deepen the roots of sustainability in agri-food systems. To that end, the project aims at harnessing scientific and local knowledge, collaboration, motivation and innovation skills around two complementary domains: (i) agro-biodiversity and (ii) the food supply chain, by making use of novel, improved and demand-driven ICT solutions. The project uses participatory bottom up data collection and top down data integration to develop solutions for these domains. NOTE: Nearly 800 million people struggle with debilitating hunger and malnutrition in every corner of the globe. That’s one in every nine people, with the majority being women and children. We are convinced that the solution to Zero Hunger lies within existing, but often unavailable, agriculture and nutrition data (GODAN Summit2016). that focuses on the transparency of the food chain in the processes related to the production, distribution and consumption of food. In CAPSELLA, farmers’ local communities and networks will interact with agro-ecology, agri-food and ICT experts to test, validate and select the innovative applications and tools best suited to their needs. Data and knowledge sharing among different stakeholders is increasingly a concern for those in the sector to complement each other’s activities, learn from each other’s insights and collaborate to create value in the sector. Based on this, the project will develop a number of community-driven data powered ICT solutions, which will be tested by the communities engaged in the project and will result in a number of pilots & demonstrators. CAPSELLA sustainable technical prototyping cloud platform will be the main project end product and will include a rich set of components and a number of added-value functions and smart ICT applications offered “as a Service” with the intention of gathering and hosting big and open data from the targeted communities. CAPSELLA is planning to exploit its results also in collaboration with agINFRA, a hub for collecting and sharing information related to agriculture and food security. A number of developers or startup companies have expressed their interest to work on technical solutions towards addressing the challenges and problems faced by local communities in the field of agro-biodiversity. from ACCESS TO LAND - a European network of grassroots organisations securing land for agroecological farming. This book, by a leading expert in urban agriculture, offers a genuine solution to today’s global food crisis. represents a comprehensive compilation of the current knowledge of food and nutrition security from a global perspective. provides insight, outreach, education around issues of food, agriculture and hunger globally - looks at using digital data to improve all aspects of farming and reduce waste. (the Food Institute of the University of Guelph). a community in Northern Greece that promote sustainable development in the remote, isolated, mountainous region of Elassona municipality. a CAPS EU funded project under Horizon 2020 - proposes a novel transdisciplinary methodology on promoting and supporting the creation of network infrastructures as commons, for resiliency, sustainability, democracy, self-determination, and social integration. a research test-bed built within its framework might be very useful for other CAPS projects.